Flatiron building – 1277 Melville St, Vancouver BC,V6E 0A4 located in the triangular intersection of Pender, Melville and Jervis. The Flatiron building is a boutique apartment building modeled after the original Flatiron building in New York City. 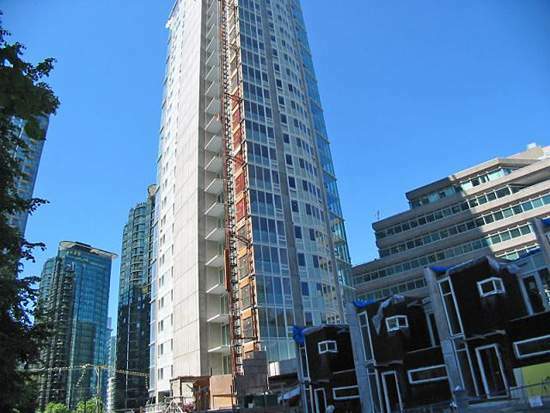 Flatiron was completed in late 2008 and rises 28 stories tall with only 52 suites inside, only 2 suites per floor.The Flatiron building is in central Coal Harbour, about 5 minutes walk from the Robson Street shopping and entertainment areas. Flat Iron is only 3 minutes walk to the Coal Harbour Community Center, 10 minutes to Stanley Park and the Coal Harbour Marina. All Flatiron apartments have over height ceilings, lots of windows, air conditioning, energy efficient electric fireplaces, hardwood flooring throughout except in the bedrooms where its thick wool carpeting, storage, pre-wired high speed internet and a balcony with 180 degree views. Kitchens are fit for a chef with polished quartz counter tops with funky looking tile back splash, custom cabinets, all luxury Kitchen Aid stainless steel appliances and four burner gas ranges. The washrooms are also luxurious with marble counters and back splash and ceramic wall tile, double vanity sinks and big soaker tubs.Security for your Flatiron condo includes surveillance cameras, restricted access elevators that only go to your floor of residence and common areas and a 24 hour concierge.